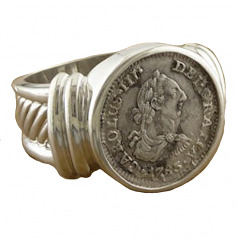 Spanish Bust Silver Half Reale Coin ring from the shipwreck El Cazador , "The Hunter" , Dated 1783. Obverse: Draped bust of Carlos III, inscription around: DEI GRATIA (By the Grace of God), date, CAROLUS III. Reverse: Crowned arms of the House of Bourbon sided by the Pillars of Hercules, assayer and legend around. Ruler: Carlos III; Mint: Mexico City; Country: Mexico; Assayer: FF. Framed in sterling silver ring . Certificate of Authenticity. Dimensions; 3/4" diameter coin in finger size 12 ring.